Eye puffiness occurs when there is an excess build up of water or lymphatic fluid under the eyes. Lack of sleep, smoking, alcohol, genetics, allergy, dehydration, iron deficiency, low blood sugar and hereditary are some of the reasons that trigger the fluid retention. Just like other cosmetic problems, we have commercial solutions for puffy eyes as well. But we do have simple natural home remedies as well. Potato can be helpful in providing relief from puffiness, discoloration and redness under the eyes. Is Potato Good for Puffy Eyes? The catecholase present in potatoes reduces the water retention under the eyes. The antioxidants and nutrients present in it keep the skin smooth and bright. The combination of coldness and starch of potatoes, develop anti-inflammatory effect. This helps in reducing the swelling. Its astringent properties tighten the skin. 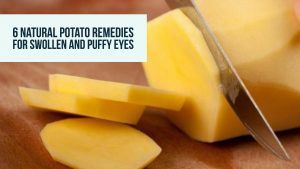 How to Use Potato for Puffy Eyes? Here, we have mentioned a detail description of using potatoes for puffy eyes. Try any of them as per your convenience regularly. Cut 1/3 inch slices of a potato. Close your eyes and place a potato slice on each eye. Leave it on for as long as you want. Remove and rinse off with water. Grate 1 medium-sized raw potato. Place the grated potato on a gauge or cheese cloth. Make two batches of them. Close the eyelids and place them on eyes. Grate or blend a potato to extract juice. Using a cotton ball, apply potato juice over the closed eyes. Leave the application until it completely dries. Apply potato juice once again and leave until it completely dries. Repeat the process 3 times daily. The anti-oxidants present in cucumber helps to reduce the irritation and redness. And its astringent properties reduce the water retention under the eyes. Blend 1/2 cucumber and 1 small potato separately to extract their juice. Mix equal amounts of potato juice and cucumber juice. Close the eyelids and apply the solution using a cotton swab. Follow the process 2 – 3 times a day. Instead of tossing out potato skin, you can use them to reduce the puffiness around the eyes. Take a potato skin and rub the inside of it around the eyes. After a minute, place the peel on closed eyes. Just like potatoes, sweet potatoes are also helpful in reducing the puffiness under the eyes. The anthocyanin compound present in it contains anti-inflammatory properties which reduce swelling and improves the complexion. Place thin slices of sweet potato under the eyes. Repeat the application 2 – 3 times a week. If the potato juice enters into your eyes, wash them immediately. Reduce the amount of salt consumption as it can cause water retention or fluid retention. Cold, allergies and sinus can also cause puffy eyes, so treating them can also help in reducing puffy eyes. Sleep position also matters in the prevention puffy eyes. If you sleep on your stomach, the gravity will causes fluid retention under the eyes. So always sleep on your back and add an extra pillow under your head. It is very important to remove makeup before going to bed. Don’t over booze. Alcohol consumption can delicate the area around the eyes. Too much sun exposure can under eye bags, so it important to apply sunscreen lotion, wear sunglasses and hats to protect your skin from sun’s harmful rays. Smoking dries and weakens the skin around the eyes. Avoid smoking. Moisturize the skin under the eyes with coconut oil or sweet almond oil. Drink 8 glasses of water daily to keep yourself hydrated. Artificial sweeteners can also cause fluid retention so avoid using them. Eat food rich in iron, Vitamin A, C, and E.
Sometimes puffy eyes are caused by underperforming thyroid glands. Check with your doctor to get diagnosed. Reduce stress by doing yoga or meditation. We hope you will try potato for treating your puffy eyes. If you have any queries or suggestions, please write to us in the comments section below. Apply any healthy oils like coconut oil, vitamin E oil, castor oil or avocado oils for treating sunken eyes. Massage a small amount of the oil around the eyes and leave it to dry completely. Repeat the process daily before going to bed. Make sure the oil doesn’t get into the eyes. Nope, kerosene is highly flammable and harmful for eyes. Avoid using it at any cost. It is better to try any potato method mentioned above in the article. Will any type of potatoes do?? Beside the sweet potatoe that was specifically mentioned?? Yes, any potato will be fine. I have a swollen and black eye . It is very irritating to see a black eye? How can I cure it fast?